Established in 1945 as an international forum to provide diplomatic solutions for the governments of the world as an alternative to war, the United Nations (U.N.) enjoys the support of nearly every nation in the world. The U.N. is headquartered in New York City in the world-famous Secretariat Building. 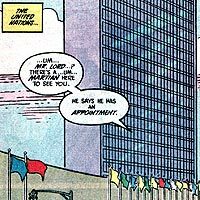 Booster Gold appeared before the United Nations General Assembly when the JUSTICE LEAGUE was granted U.N. sponsorship. For years, Booster lived in embassies maintained by the U.N. for the JUSTICE LEAGUE INTERNATIONAL and lived off U.N. paychecks.